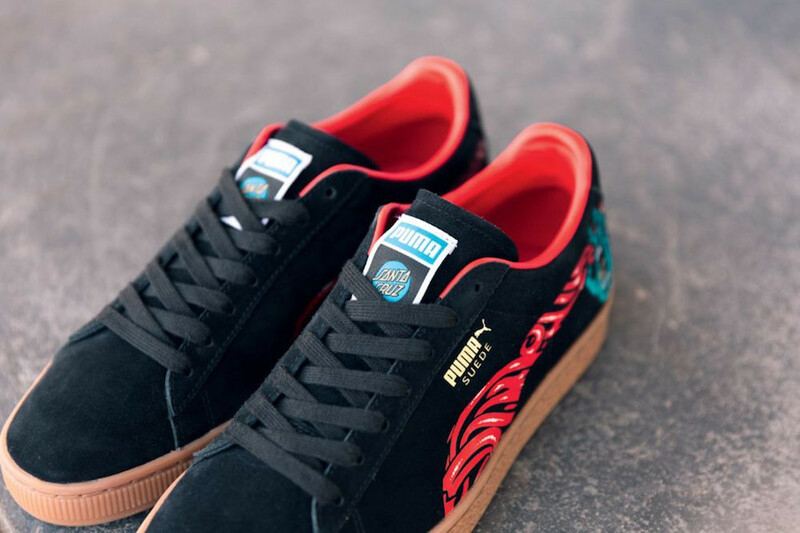 PUMA continues to celebrates 50 years of Suede excellence by rolling with Northern Cali natives and skate culture icons Santa Cruz Skateboards in the latest of epic anniversary collaborations. The PUMA Suede is highlighted with its Screaming Hand – Santa Cruz’s main logo, embroidered on the side of each heel, the Blue hand against the Black suede upper. The Formstrip becomes the scream, a wave of Red sound and adrenaline. The artwork is enveloped in a lush Black suede upper atop a Gum sole. The PUMA and Santa Cruz logo is featured on the sneaker tongue. Complementing the sneaker is the PUMA x Santa Cruz Tee which makes it a highly collectible pack. Look for the Santa Cruz x PUMA Suede 50 to release on July 26th at select retailers and PUMA.com.